Whether you run a burger joint, a hole in the wall or the hottest joint in town, offer your customers comfy chairs and delicious food, with a side of great hospitality, and they’ll keep coming back for more. Never underestimate the impact of good, solid, wobble-free chairs on your business. 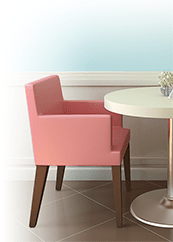 Aside from the quality of the food, the chair is one of the most significant factors in overall customer satisfaction. Restaurant Chairs, Wood Chairs, Metal Chairs, Metal Indoor & Outdoor Chairs, Distressed Indoor-Outdoor Chairs, Banquet Chairs, Chiavari Chairs, Cross Back Chairs, Stacking Chairs, Folding Chairs, Parsons Chairs, Upholstered Restaurant Chairs, Aluminum Chairs, Contemporary Chairs, Plastic - Resin Chairs, Dining Benches, Kids Seating, Chair Covers and Seat Cushions.